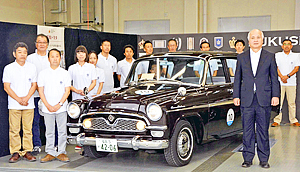 FUKUSHIMA － Fukushima Toyota Co. has completed a yearlong project to restore a classic car with the aim of encouraging reconstruction efforts in disaster-stricken Fukushima Prefecture. The company revealed the restored first-generation Toyota Crown last month. The vehicle was unveiled to the public in the prefecture after completing a 430-kilometer journey from Aichi Prefecture to Tokyo in August. "Having put our thoughts and hopes for reconstructing Fukushima into the project, we finally made it come true," said Kensuke Sato, Fukushima Toyota president. Sato spoke on Sept. 12 at the company's car allocation and maintenance facility. To commemorate 60 years since the first Crown series went on sale, Toyota dealers nationwide took part in a yearlong project to restore Crown models from different years. As part of its own project to celebrate the 70th anniversary of the founding of Fukushima Toyota, the company in August last year began to restore a Crown Model RS31 that had been in storage for about 20 years. To participate in the restoration of the car, which originally went on sale in 1962, 36 engineers and sales staff members were chosen from applicants within the company. According to Sato, 64, it was "one of the top five nationwide restoration projects" in terms of difficulty. Almost every part, from the body to the engine, had to be replaced. Some parts had to be made from scratch. The restored Crown was given a new sheen with a red-brown coating of paint that was unavailable when the car was originally produced. When the restoration work began last summer, the car, with a 1,900 cc, 90 horsepower engine, was partly corroded, with many parts unusable after extended exposure to rain. But 54 volunteers managed to restore the original style of the car's body by reworking steel and using their skills. "The young and veteran workers were challenged by the project because they didn't even have a drawing of the car to refer to," Sato said. "The project symbolized the handing down of technical skills to younger generations － a task that all dealers face." The restored car is being displayed at various dealerships in Fukushima Prefecture. Fukushima Toyota employee Kinzo Shishido was in charge of repairs to the body of the car. "One of my dreams as a car engineer came true," he said with a smile. Shishido, 60, reached retirement age in January. He currently works as a temporary employee. Restoring the first-generation Crown, which had been stored on company grounds, had been a longtime dream of his. Shishido, who became a core member of the restoration team after volunteering to take part, drove the car across the finishing line in the journey from Aichi Prefecture to Tokyo. "Through the work to restore this car, once again I could appreciate the quality of the highly skilled engineers of that era," Shishido said. "I'm glad we worked on this project with my colleagues including young engineers."